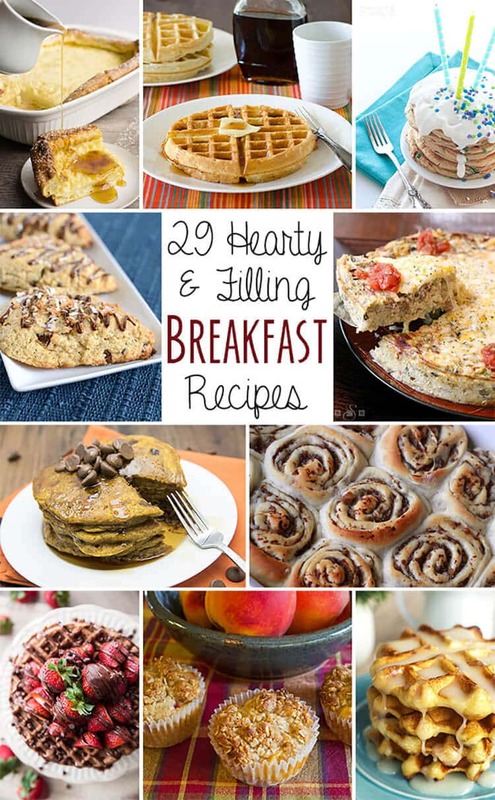 Not to be repetitive but my love of Breakfast foods is well documented. Breakfast for Breakfast and Breakfast for dinners are quite common at our house, so we have a lot of recipes to pick from. This one is fast, easy, only 4 ingredients AND ingredients we ALWAYS have! It’s so easy my teenagers are now in charge of making it, it’s impossible to mess up. I was first introduced to “rising eggs” by my uncle. 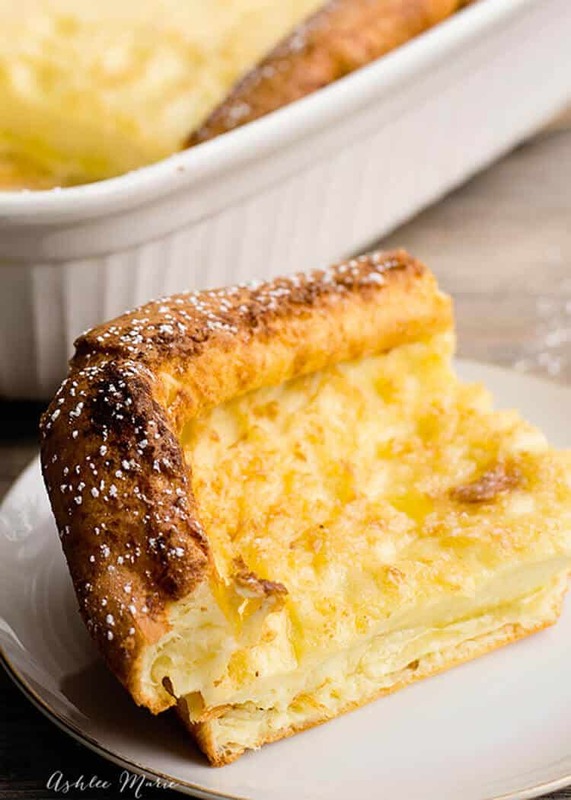 They are also known as Dutch babies or Hootenannies (don’t ask me why) but we’ve stuck with the traditional German Pancakes at our house. We serve it with pretty much anything. Maple Syrup, Berry Coulis (with fresh berries), fresh lemon juice and powdered sugar is my favorite, Buttermilk Syrup and of course Lemon Syrup (coming soon – my kids at it all before I could get pictures). You can make them in ANY pan, I see mini ones in muffin tins, baked in cast iron skillets and the traditional 9×13 pan (traditional at our house at least). I’ve seen them topped with pretty much everything under the sun, and even baked with extras like apples, fresh fruit and more. I’m going to have to experiment next time. In the video I’m sharing how you can get a slight change in the thickness of the center based on how you mix in the eggs. Making a full or half batch obviously makes a difference, as you can see in the pictures. But the tip still applies, thicker center less mixing, thinner center more mixing. You can even get out the hand mixers to make more of an impact if you like it thin! Pull it out when the butter is melted, but before the butter burns. Mix the flour and salt, add the milk and mix it until smooth. If you are halving your recipe (6 eggs) cook for 16-18 mins. For the larger batch (12 eggs) cook for 20-22 mins. When it's done pull your kids around so they can see how tall the sides have grown (especially if your doing the thinner/taller method!) because the sides start to shrink and fall fast. 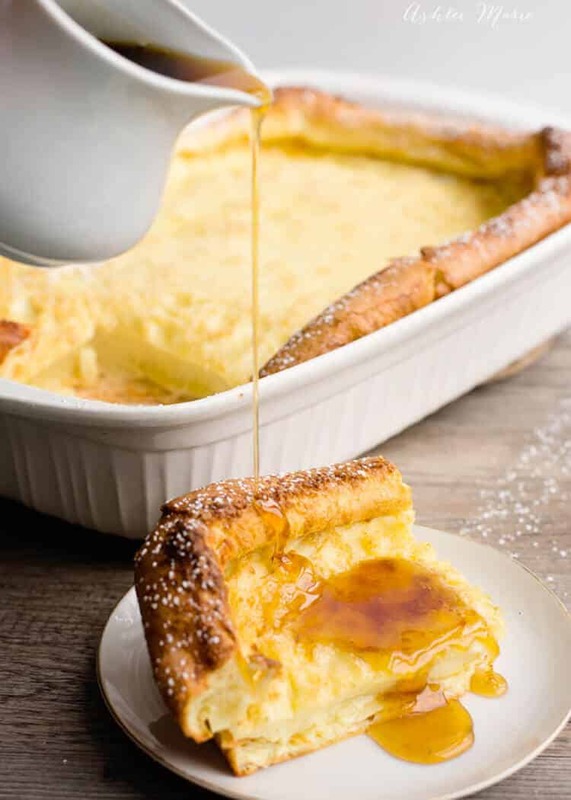 Serve with your favorite syrups OR my favorite way serve with powdered sugar and fresh squeezed lemon juice! Crazy story, this was actually one of my original blog recipes from YEARS ago, when my photography sucked. SO when I re-branded last year I actually took down quite a few old recipes looking to take new pictures and re-release. I figured no one would notice, but when I was on our family trip and we stopped in Navuoo for church a lady recognized me (that NEVER happens in Utah) and asked me where my German Pancake recipe went to! SO HERE it is again!!! It’s National Breakfast Month! Which is fitting cause it’s also my birthday month! Favorite month, favorite food… Goes together well, huh? ANYWAY, it’s another Celebrating Food holiday for the year, where 10 of us food bloggers get together to each celebrate one food holiday a month! Not surprising we picked to celebrate Nation Breakfast month instead of just any old day! Enjoy our 10 new recipes AND 19 bonus recipes! Peach and Oatmeal Muffins – Jamie Cooks It Up! Fresh Peach Syrup – Jamie Cooks It Up! Thanks! We seriously make it about once every other week if not EVERY week. 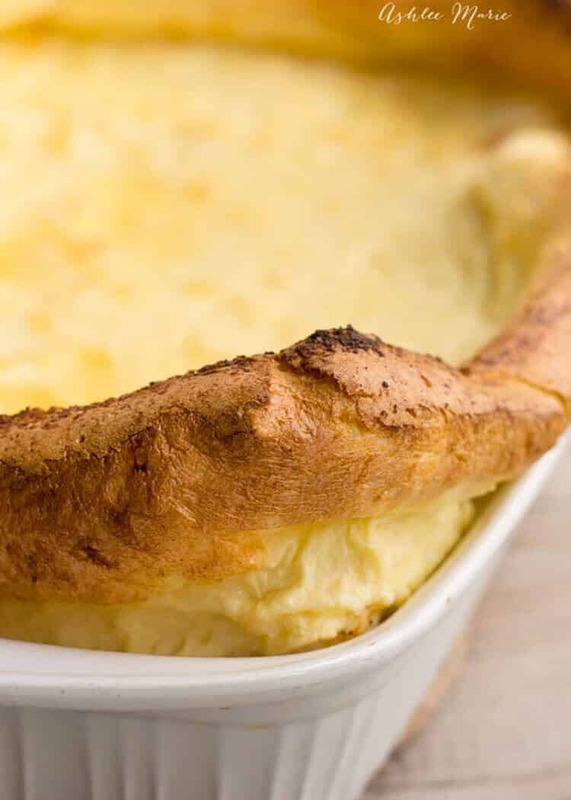 I’ve never had yorkshire pudding, but if it’s like this I’m sure I’d love it! I am going to have to try this with my kids. We make swedish pancakes, but have never tried German ones. I bet they’ll love it. Thanks for the recipe and tips! I haven’t made these in forever! Tomorrow morning baby! And thanks for the tip on making them thicker, tell you how it goes! Let me know how it works for you. Notice I double the batch we grew up eating, having boys does that to a meal!!! We used to make a 6 egg version (also in a 9×13), but the family is so big now I’m up to the 12 egg version. I bet you could even do a 3 egg version in a 8×8 pan. I’m not into the leftovers so I like to make the size I’ll eat, but my husband doesn’t mind helping me out a bit if I make too much! Let me know what you think of the thicker version. Also I LOVE fresh lemon juice and powdered sugar as a change from syrup sometimes! Like I said, my kids call them rising eggs. They don’t even know that the official name (at least I THINK it is) is German Pancakes. In fact I’ve heard them called by at LEAST 1/2 a dozen different names over the years. In the end they are just delish so who really cares, right? Do you make them too? thanks for the tips on making them thick. I’ve been battling this for a long time and finally gave up on making them because mine always shrink down so much and get so thin! I hope it works as well for you! I know some people LIKE them thing- but I’ve never understood that!!! Thank you for sharing your tip on how to make them thicker. These have been a family tradition of since I was a little girl. I have been making your thicker version since Christmas and it is now my favorite! AWESOME!!! I adore the thicker version, obviously, and I’m glad you like it too! I made these and the Caramel syrup for breakfast the other day. Oh my, it was sooo good. I have had some of the leftover syrup on ice cream twice. Amazingly good! Thank you for sharing. Mmmm I haven’t tried the caramel syrup over these, I’ll have to break some out next time I make them! I made German pancakes for the first time using this recipe! It was also my 7 and 4 year olds first time trying them. They rarely EVER try new things, yet alone like it. But we all absolutely loved this recipe! It was sooo yummy! I’m so glad! We absolutely LOVE it over here, we make it all the time, my kids not only love eating it, but love watching the oven as it bakes! It keeps them occupied the last 5 mins so I can set the table in peace! Back in 1966 I worked as a bussboy in a pancake house in Fort Collins, Colorado. The cook would serve German pancakes with very high sides. I had gotten the recipe from him but years later could not find it. Thanks, and I will try using your recipe. I hope it reminds you of the ones you used to have! To really get high sides make sure to REALLY whip it! That explains it! I had wondered why my favorite recipe has not been puffing up like normal and it is because I started using a stick blender and most likely was overbeating the eggs! Will try it today with the gentler mixing! How did it go? My oldest and husband both over beat, boo, but the kids love the high sides so they don’t mind, while I love the thick eggs! 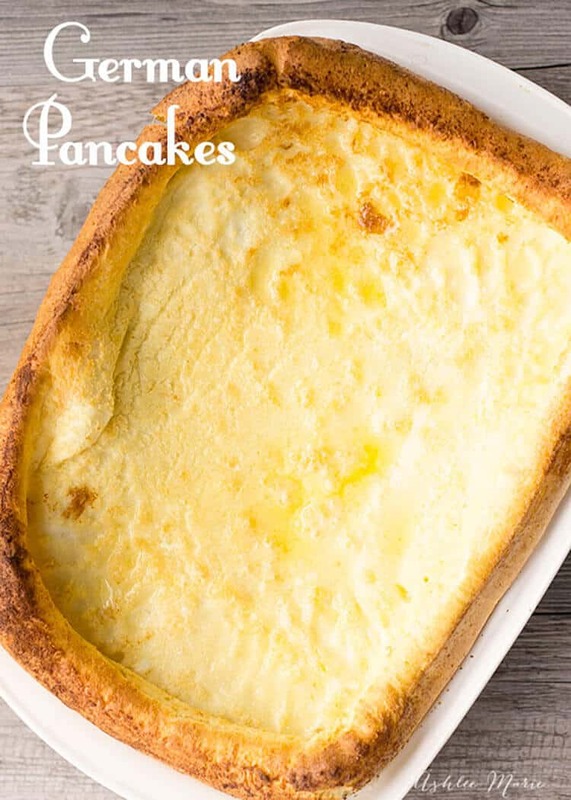 These are an absolute favorite at our house- especially with buttermilk syrup. I grew up with them, and they are soooo good! Oh, I LOVE German pancakes! seriously me too! So so SO good! Iots of good gravy . Delicious ! REALLY! I’ve always wondered what yorkshire pudding is! love savoury food, I think I need to take a trip to the UK!